The North Atlantic with its spring-bloom ecosystem has its particular responses to climate change, many of them different from the other parts of the world's oceans. The system is strongly influenced by anthropogenic climate change as well as to strong decadal to multidecadal natural climate variability. In particular, the northernmost part of the system and the Arctic is exposed to higher increase in temperature than any other ocean region. The most pronounced examples of poleward migration of marine species are found in the North Atlantic, and comprise the recent warming phase after the 1970s. The latitudinal asymmetric position of the Arctic Front and its nature of change result in a considerably larger migration distance and migration speed of species in the Northeast Atlantic part of the system. However, we here hypothesize that there is a limit to the future extent of poleward migration of species constrained by the latitudinal region adjacent the Polar Circle. We define this region the critical latitudes. This is because the seasonal light cycle at high latitudes sets particular demands on the life cycle of planktivorous species. Presently, boreal planktivorous species at high latitudes deposit lipids during the short spring bloom period and overwinter when phytoplankton production is insufficient for feeding. Unless invading temperate species from farther south are able to adapt by developing a similar life cycle future poleward migration of such species will be unlikely. The North Atlantic spring-bloom ecosystem extends from the northern rim of the North Atlantic subtropical gyre at about 30°N to the Arctic ecosystems of the Davis Strait between Canada and Greenland, across the Fram Strait between the Norwegian Sea and the Polar Basin and along the northernmost part of the Barents Sea at 80°N (Hoegh-Guldberg et al., 2014). The region is characterized by a predominant seasonal cycle in the primary production with the peak amplified and delayed with increasing latitudes (Racault et al., 2012) and with shortened bloom duration (Ellingsen et al., 2008). This is largely due to the extreme light cycle to the north of the Polar Circle where winter dark ceases primary production. This northernmost part of the North Atlantic is unique as it is the only part of the world oceans with ice-free, open-water conditions under the extreme light cycle of winter dark and summer midnight sun. In the northern North Pacific a similar light cycle only exists to the north of the Bering Strait within the Polar Ocean, and in the Southern Hemisphere the Antarctic continent occupies similar southern latitudes (Figure 1). Figure 1. The seasonal light cycle strongly structures the phytoplankton production at high latitudes, and this effect cascades to higher trophic levels. Right panel shows latitudinal variation in daylight length for the two solstices (about 21 June and 22 December) and for the two equinoxes (about 20 March and 22 September). The source of the global map of annual mean chlorophyll concentration is from SeaWIFS satellite sensor averaged over the interval 4 September 1997–30 November 2010 (left panel). http://oceancolor.gsfc.nasa.gov/cgi/l3/S19972472010334.L3m_CU_CHL_chlor_a_9km.png?sub=img. Different from terrestrial ecosystems at high latitudes primary production at sea is asymmetric compared to the light cycle because of the extremely efficient nutrient uptake of the tiny and numerous phytoplankton with its high surface-to-volume ratio. This causes the nutrients that are mixed up from the depths into the photic zone during winter to be consumed very rapidly when light returns at spring time. After the collapse of the spring bloom, due to zooplankton predation and nutrient exhaustion, the summer production continues at much lower level primarily caused by regenerated production. Annual net primary production (NPP) ranges from about 500 g C year−1 in coastal regions to about 150 g C year−1 in the highest latitudes of the North Atlantic (Mueter et al., 2009). The southern and warmest part of the biome seems to have the highest primary production (Mueter et al., 2009). In the open-ocean, the system is dominated by diatoms in the initial phase of the spring bloom exhausting the silicate from the photic zone. It is followed by a flagellate-dominated phytoplankton community during moderate summer production (McQuatters-Gollop et al., 2007; Fox et al., 2009). Organisms at higher trophic levels in Northeast Atlantic ecosystems are adapted to the seasonal cycle of the primary production with predominant seasonal activity in feeding and reproduction. Particularly egg production and the subsequent occurrence of the plankton-feeding offspring must be tuned to the seasonal cycle of the plankton production. Lack of synchrony in these processes has been hypothesized to cause recruitment failure to fish stocks (e.g., Hjort, 1914; Cushing, 1982). In the southern part of the biome winter primary production can be high enough to sustain autumn and winter spawning behavior, but at higher latitudes, particularly to the north of 60°N, marine organisms are increasingly forced into the spring-spawning cycle (e.g., Ellertsen et al., 1989) because of nearly complete absence of primary production during the dark winter time. This high-latitude seasonal light cycle has developed herbivore copepods with the particular attribute of very efficient feeding during the short phytoplankton production season and deposition of large stores of lipids for overwintering at deeper depths during winter (Falk-Petersen et al., 2009). The dominant zooplankton species with such attributes are the arcto-boreal Calanus finmarchicus and the Arctic Calanus glacialis and Calanus hyperboreus (Melle et al., 2004). The planktivorous Norwegian spring-spawning herring (Clupea harengus) is particularly adapted to the feeding on C. finmarchicus and has consequently developed a similar overwintering strategy (Holst et al., 2004) implying that the fish migrate out of the pelagic layer to larger depths where they reduce their activity. However, different from C. finmarchicus the herring is not dispersed in the deep layers, but maintains their schooling behavior during overwintering. Other planktivorous fish species have developed different adaptations. For example, the more temperate-adapted Atlantic mackerel (Scomber scombrus; Uriarte and Lucio, 2001) and the blue whiting (Micromesistius poutassou; Bailey, 1982) uses the high latitudes for summer feeding only, and migrate out of the high latitudes and southwards into regions where plankton concentrations are high enough to maintain winter feeding (e.g., Casini et al., 2004). Although bottom fishes and other piscivore species feed on larger organisms during winter and are independent of the plankton for food in the adult stages their planktivorous offspring must co-occur with the primary production cycle, and their spawning cycles must be tuned accordingly. Hence, the seasonal light cycle that is independent of climate change has a profound influence on organisms at all trophic levels in high-latitude marine ecosystems. Northward migration of lower-latitude temperate species induced by climate change may become constrained due to lack of adaptation to the needed lipid deposition and overwintering. The North Atlantic Ocean has the most comprehensive time series of abundances of marine organisms from zooplankton to fish with which to examine climate impacts. Some of these time series extend back more than 100 years (e.g., Nakken, 1994; Toresen and Østvedt, 2000; Kjesbu et al., 2014). These allow a particular perspective on climate change in this region compared to other parts of the world's oceans. A range of spatio-temporal scales of variability has been identified, from interannual to multidecadal time scale. Generally, spatial and temporal scales are interlinked with climate phenomena of larger spatial extent having longer time scales (Drinkwater et al., 2014). Here, we will limit the description of climate variability to two specific phenomena, the interannual- to the decadal-scale North Atlantic Oscillation (NAO), and the Atlantic Multidecadal Oscillation (AMO). With a periodicity of approximately 60–80 years (Delworth and Mann, 2000; Alexander et al., 2014), it is difficult to distinguish between AMO-related increases in ocean temperatures and a climate change signal when analyzing relatively short time series. Likewise, attributing changes in short biological time series to responses to climate change may be misleading. The NAO, on the other hand, with its interannual to decadal-scale mode of variability and its limited spatial extent, compared to AMO, is trivial to distinguish from the anthropogenic global climate change. The two phenomena have been associated with a wide range of impacts on the marine ecosystems and their organisms. An overview of NAO impacts is presented by Hurrell et al. (2003); and overview of AMO is presented by Alheit et al. (2014). The effects of decadal-scale climate variability has been well documented, particularly the impacts of NAO, an observed atmospheric pressure difference anomaly between the Icelandic Low (measured in western part of Iceland) and the Azores High (measured either on the Azores or at Lisbon, Portugal; e.g., Hurrell et al., 2003). The NAO is associated with opposite temperature and current flux manifestations in the Northeast and the Northwest Atlantic (Sundby and Drinkwater, 2007) and opposite storm tracks and precipitation in the northeastern and central-eastern/Mediterranean areas of the North Atlantic (López-Moreno et al., 2011). The impacts of the NAO on marine ecosystems are comprehensive and well documented (e.g., Drinkwater et al., 2003) although the mechanistic understanding is often unclear since the NAO results in changes in a number of climate variables such as sea temperature, wind forcing, volume flux changes, vertical mixing, precipitation and light conditions through its effects on cloudiness. In addition, due to the spatial differences in the NAO effects on the climate variables in the North Atlantic, the different regions of the North Atlantic display a large diversity of ecosystem responses. In the northeastern North Atlantic impacts on the marine ecosystems have been mainly associated with the combined effects on flux variability of Atlantic water into the region and temperature. In the Barents Sea high NAO index results in increased inflow of Atlantic water masses and higher temperature (Sundby and Drinkwater, 2007) resulting in higher production of plankton (Dalpadado et al., 2014). In turn, the higher temperatures are associated with increased fish production (e.g., Kjesbu et al., 2014). In the Mediterranean region positive NAO index is associated with lower than normal precipitation (Trigo, 2011). In the western Mediterranean catches of a number of coastal fish species increased with increased wind mixing and runoff from land associated with negative NAO index (Lloret et al., 2001). The responses to fisheries in the other parts of the Mediterranean are different from the western part as displayed through the fisheries of European hake (Maynou, 2011). A more comprehensive overview of the NAO-linked responses in the northeastern part of the North Atlantic and in the Mediterranean Sea are presented by Drinkwater et al. (2003) and Vicente-Serrano and Trigo (2011), respectively. The other predominant climate mode, the AMO, is defined as the detrended sea surface temperature anomaly averaged over the North Atlantic from the equator to between 60° and 70°N, with the actual latitude chosen being author-dependent. An AMO-like periodicity has been detected from tree-ring data extending back to the sixteenth century (Gray et al., 2004) and to the fourteenth and fifteenth centuries in marine paleo records in the Caribbean (Kilbourne et al., 2014). The AMO has an opposite but weaker mode in the southern hemisphere (Sutton and Hodson, 2005). The temperature increase in the North Atlantic since the late 1970s has occurred during a phase of increasing AMO implying that both the anthropogenic climate change and the positive phase of the AMO have contributed to increase the temperature in the North Atlantic sector during the recent 40 years. Because of the long time scale of the AMO and the switch to a positive phase since the late 1970s, it is challenging to interpret how large fraction of the recent temperature increase over the North Atlantic is related to the AMO and how much is caused by global anthropogenic climate change. In sum, the observed increase in sea surface temperature from 1970 to 2010 is higher in the northern North Atlantic than anywhere else in the world oceans (Rhein et al., 2013). For the same reason the Arctic sea-ice decrease since 1978 observed from satellite imagery (http://nsidc.org/arcticseaicenews/) should be interpreted with care as a global climate change signal since the AMO signal also extends into the Arctic (Drinkwater et al., 2014). In addition to the temperature signal the positive phase of AMO (high temperatures) is associated with anomalous low pressure between 20°S and 50°N causing reduced wind speed over the tropical Atlantic and increased precipitation in the eastern part of the tropical Atlantic (Alexander et al., 2014). Impacts of the AMO variability on marine ecosystems have been documented for both planktivorous and piscivorous fishes, and as well as for zooplankton, although the latter is limited to the recent phase of temperature increase after the 1960s. The previous warming phase of AMO that occurred from the 1920s–1940s caused similar changes in the high-latitude marine ecosystems, as those during the recent warming. The warming in the early twentieth century was noticed by the marine science community, particularly the fish biologists, with a special ICES conference on climate change held in 1948 (Rollefsen and Vedel Tåning, 1949). Drinkwater (2006) presented a comprehensive review of the changes in the high-latitude part of the North Atlantic from Labrador to the Barents Sea during this first warming phase of the AMO in the twentieth century: Zooplankton abundance, although limited, appeared to have increased in most of the regions. Several herring stocks increased in biomass. Gadoid species such as cod (Gadus morhua) and haddock (Melanogrammus aeglefinus) increased in biomass and shifted northwards with their northernmost fringes into the Arctic. Benthic species advanced toward Arctic regions. At the tail of the moving boreal distributions, warm-water species came into the region from the south. Alheit et al. (2014) showed that small pelagics, such as sardines and anchovies, became more abundant in the southern and central-eastern North Sea during both of the two AMO warm phases in the twentieth century. In the Mediterranean Sea, higher abundances of small pelagic fishes also seemed to be in phase with the warm mode of AMO (Alheit et al., 2014). Moreover, these authors pointed out that the earlier described Russell Cycle in the North Sea (Cushing, 1957; Russell et al., 1971) appears to be in phase with the AMO. In the central western part of the North Atlantic (US east coast) a number fish species, particularly demersal species, moved poleward during the recent AMO warming period 1970–2008 by up to 8 km per year (Nye et al., 2009). These patterns of regional change resemble many of the AMO changes in the northeastern North Atlantic with increase in fish abundance in the north and decrease in the south (Nye et al., 2014). The link between AMO and phytoplankton production is much less clear (Nye et al., 2014). This could be because changes in phytoplankton production are rather linked to other climate variables than ocean temperature itself, particularly to changes in vertical mixing that provides the nutrient flux from the deep layers to the photic zone where photosynthesis can occur (Boyd et al., 2014). For example, increased winter wind mixing during positive AMO modes increased phytoplankton production in the Mid-Atlantic Bight (Schofield et al., 2008). At higher latitudes of the North Atlantic, i.e., the Gulf of Maine, the Norwegian Sea, and the Barents Sea, increased temperature has been shown to increase the phytoplankton production (Mueter et al., 2009). It is, however, unclear to what extent such correlations are mechanistically caused by the temperature itself or by a combination with other climate variables. The reported ecosystem responses to the AMO cited above cover limited phases of the AMO “cycle,” either the warming phase from the 1920s to the 1940s (e.g., Rollefsen and Vedel Tåning, 1949; Drinkwater, 2006) or the recent warming phase from the 1970s. However, for two high-latitude fish species of the North Atlantic time series are available covering more than one full AMO cycle. Abundance estimates for the Norwegian spring-spawning herring (NSSH) inhabiting the Norwegian and Barents seas and for the Northeast Arctic cod (NEAC) inhabiting the Barents Sea are available from the beginning of the twentieth century. In addition, spatial spawning distributions are available for the NEAC from the beginning of twentieth century to 1975. Toresen and Østvedt (2000) showed that the spawning stock biomass (SSB) of the NSSH varied through the twentieth century in concert with the long-term averaged temperature variations similar to the AMO signal. During the cool period between 1900 and 1920 SSB ranged between 2 and 4 mill. tons. Thereafter, it increased abruptly with the temperature increase and ranged between 9 and 16 mill. tons during the warm phase between 1930s and 1950s. The collapse of the stock in the 1960s has been considered as the combined effect of cooler climate and overfishing (Toresen and Østvedt, 2000). The SSB fell to less than 100,000 tons in 1969 and it was uncertain during the 1970s whether the NSSH would ever recover. However, during the extraordinary spring of 1983 strong year classes of NSSH and NEAC, as well as the Northeast Arctic haddock, were produced, and this became the start of the recovery of Barents Sea fish stocks and, particularly, the new herring period that reached it new maximum SSB during the recent warm phase of AMO, peaking around 10 mill. tons in 2009. The SSB of NEAC developed similarly to NSSH through the twentieth century although the NEAC did not collapse in the 1960s, but only reached a low level. Fishing yields of cod were relative low during the first decades of the twentieth century. The SSB reached a peak in 1947 of nearly 1.2 mill. tons. Thereafter, it decreased during the cooling phase in 1950s and 1960s. During the 1960s and 1970s the SSB varied between 100,000 and 300,000 tons, before the new increasing phase of the AMO from the early 1980s that contributed to the SSB reaching its all-time high in 2012 of about 1.9 mill. tons (Hollowed and Sundby, 2014). In concert with the increasing SSB, increasing sea temperature, and the retreating ice edge in the Barents Sea the NEAC is presently feeding farther north in the summer than previously recorded including along the shelf edge toward the Polar Basin north of Svalbard (Kjesbu et al., 2014). Also the spawning intensity of NEAC at the spawning sites along the Norwegian coast has varied in concert with the AMO (Sundby and Nakken, 2008). During cool phases the spawning site center of gravity is displaced southward toward the Møre coast of mid-Norway while during warm phases spawning sites along the Finnmark coast toward the Russian border are reoccupied. The mean annual sea temperature of the Atlantic water masses (0–200 m depth) in the eastern Barents Sea [represented by the Kola Section (www.pinro.ru)] has ranged from 3.2 to 4.9°C since 1900. Presently, it seems that the recent positive AMO phase (for the entire North Atlantic) still has not reached the peak value (Alexander et al., 2014), although the data from the northernmost fringe of the AMO region (Kola Section of the Barents Sea) indicate that peak may have been reached between 2006 and 2010. As described above, NSSH and NEAC have responded linearly and reversibly in terms of both their spatial distribution and abundance within this temperature range, i.e., species displaced northwards during warming phases and southward again during cooling phases of AMO (e.g., Sundby and Nakken, 2008) It is however, unclear whether these boreal species will continue to respond linearly and reversible to future temperature changes predicted throughout the present century. According to all of the climate scenarios (IPCC, 2013) these changes are expected to result in considerable higher ocean temperatures than those observed through the past century, particularly at high latitudes of the northern hemisphere where the regional temperature increase is expected to be twice as large as the global average (Collins et al., 2013). This is higher than anywhere else on the globe. The Atlantic cod stocks are presently distributed around the North Atlantic in waters with ambient annual mean temperatures ranging from 2 to 11°C. For the present largest Atlantic cod stock, the NEAC, ambient annual mean temperature is about 5°C. Planque and Frédou (1999) analyzed how past and present natural temperature variability impact recruitment in Atlantic cod stocks. They found that those cod stocks with ambient temperature below about 7°C benefited from increased temperature while those cod stocks inhabiting ambient temperatures above 7°C had reduced recruitment under increasing temperature. Based on these results Drinkwater (2005) estimated the anticipated changes in abundance of Atlantic cod stocks under temperature increases of 1, 2, 3, and 4°C assuming that the existing thermal envelope of the Atlantic cod stocks would not change. While the cod stocks at their southern limit (i.e., Georges Bank, Celtic Sea and North Sea cod stock) were anticipated to decrease or possibly collapse at only a 1°C temperature increase, only the those at the northernmost fringe would initially increase and remain high for the highest (4°C) temperature rise. However, the recent RCP8.5 scenario (IPCC, 2013) indicates a considerably higher regional temperature increase by the end of twenty first century in the Arctic regions. Under such a scenario distribution of Atlantic cod stocks would probably collapse to the coast of Greenland. The observed temperature preferences for Atlantic cod stocks as described above is assumed to be associated with the direct effects on basic physiological processes (Pörtner et al., 2008). However, in addition, temperature could also be a proxy for the abundance and transport of key zooplankton prey upon which the early life stages of cod depend (Sundby, 2000). This is particularly true for Calanus finmarchicus that has similar temperature preferences to many boreal fish species but their distributional responses to climate change are different from fish species along the continental shelves as C. finmarchicus depend on overwintering at large ocean depths off the shelves (Heath et al., 2000). Hence, responses of fish to climate change are more complex than under the assumption of only direct temperature responses. Particularly, a successful migration and displacement of spawning areas of Atlantic cod to the high-latitude shelf edges toward the Polar Ocean would depend on C. finmarchicus successfully establishing themselves in the Polar Basin or an increase in other potential key prey species such as C. glacialis and C. hyperboreus. The fundamental and generic processes influencing the new primary production are (1) the vertical flux of nutrients from the depth into the photic zone and (2) photosynthetic light from above (Boyd et al., 2014). Temperature itself has a minor role influencing these two processes except indirectly through its effect on the thermal stratification that contributes to controlling the vertical flux of nutrients. Other important factors controlling the vertical flux of the nutrients (Chavez et al., 2011) are wind-induced turbulent mixing and fresh water run-off from land in coastal regions, while cloud cover influences light levels. It should be emphasized that all these climate processes may show a diversity of correlations to temperature disguising the responsible mechanism(s). Caron and Hutchins (2013) pointed out that the link between temperature and other important physical processes for primary production vary strongly across ecosystems and biomes of the world oceans, including the wind-induced transport of iron-containing dust to the ocean regions. In addition, primary production is influenced by microzooplankton and bacteria. This might be of particular importance in cold-water environments (Rose and Caron, 2007; Rose et al., 2009). Recently, Wernand et al. (2013) reported that old observations of ocean color from 1889 compared with the present data on ocean color from satellite observations indicate that the changes have developed differently in the various parts of the world oceans, increasing biomass in the North Atlantic and the northwestern Pacific, and decreasing in the other parts of the Pacific Ocean and in the Indian Ocean. These results support the scenarios on primary production modeling that increase in temperature causes increased primary production at high latitudes (Bopp et al., 2013). Although temperature itself is only an indirect factor for the primary production it appears to be positively correlated with primary production at high latitudes. Higher (lower) temperatures in the northernmost latitudes of the North Atlantic have been observed to lead to increased (decreased) primary production (Mueter et al., 2009). This has been observed under natural climate variability phenomena such as the NAO based on continuous plankton recorder (CPR) data (Edwards et al., 2001) and the AMO as observed from satellites (Martinez et al., 2009). In addition, global modeling in this part of the world's oceans (Steinacher et al., 2010; Bopp et al., 2013), as well as regional modeling in the Barents Sea (Ellingsen et al., 2008) show that increased temperature under future global climate change will likely increase primary production at high latitudes, particularly above the Arctic Circle. There are multiple causes linking temperature and primary production at these latitudes. Here, the direct effects of increasing temperature have been hypothesized to result in an earlier onset of the spring bloom (e.g., Sverdrup, 1953; Lewandowska and Sommer, 2010) and hence a longer production season (Kahru et al., 2010; Dalpadado et al., 2014). In regions with seasonal variations in sea-ice cover, higher temperatures reduce sea-ice extent which also results in earlier blooms, a longer growing season and increased area available for production, thus resulting in higher productivity (Mueter et al., 2009; Kahru et al., 2011; Dalpadado et al., 2014). Satellite-derived chlorophyll estimates and observations from the in-situ SAHFOS plankton recorders confirm that the growing season increased in the Northeast Atlantic and the North Sea between 45 and 60°N during warm periods (Raitsos et al., 2014). On the other hand, in the tropics and subtropics of the North Atlantic increased temperature has been observed to shorten the growing season (Racault et al., 2012) and to reduce the phytoplankton abundance in the temperate region of the northeastern Atlantic (Richardson and Shoeman, 2004). This is primarily due to decreased nutrient availability caused by increased thermal stratification. In northern regions, high summer temperatures may also increase remineralization causing increased regenerated production subsequent to the spring bloom. The issue of how grazing from zooplankton might interact with climate change to impact primary production was addressed by Chust et al. (2014) for a wide range of different marine ecosystems using a hydrodynamic climate model coupled with a biogeochemical, phytoplankton and zooplankton model system. Model results from the 1980–2000 were compared with 2080–2100. An increase in net primary production occurred in the Barents, Baltic, Celtic, Black and Adriatic seas, while in the Atlantic margin, North Sea, Bay of Biscay, Aegean Sea and the Benguela upwelling region net primary production decreased. For some of the ecosystems an amplification of the change occurred from phytoplankton to zooplankton. In the Barents Sea and in the northern Baltic Sea the positive amplification was particularly large, apparently because of reduced sea ice extent. Alvarez-Fernandez et al. (2012), who analyzed the North Sea phytoplankton during the shifting climate from the cold 1970s to the present warm phase, found that wind speed, humidity and air temperature, in addition to the inflow of Atlantic water between the Orkneys and Norway, were the major abiotic driving forces for the plankton biomass seasonal dynamics through most of the period studied. A comprehensive literature exists for marine zoogeography, their temperature habitats, and how the recent warming since the 1980s has displaced species polewards in the North Atlantic. However, literature on species-wise geographic distribution of phytoplankton and marine microbes are sparse, and consequently little is known about how climate change impacts the distribution of the various species. Mesocosm studies indicate that temperature-induced changes in zooplankton grazing might influence phytoplankton diversity subsequent to the spring bloom (Lewandowska et al., 2014). Phenology of the succession of the spring bloom of the North Atlantic is well described with the initiation of diatom bloom succeeded by flagellates and coccolithophorids (Margalef, 1978) and linked to the changes in turbulent mixing, stratification and light. With respect to temperature changes, however, phytoplankton might have considerably higher phenotypic plasticity than organisms at higher trophic levels (Rubao et al., 2010). This in turn supports our review above that other climate processes and variables than sea temperature (e.g., turbulent mixing, stratification and light) are more important ambient factors for phytoplankton. In addition, bacterial activity and the grazing from zooplankton might structure the phytoplankton community. Boreal and Arctic herbivore copepod species like C. finmarchicus, C. glacialis, and C. hyperboreus are all adapted to the extreme short and hectic spring-bloom dynamics at high latitudes, i.e., north of about 64°N. They accumulate lipids during the intense bloom season and overwinter at depth during the dark winter when no phytoplankton is produced. Scott et al. (2000) found that the lipids comprised between 31 and 70% of the dry mass of these three hibernating species by the end of the growth season (August-September) in Kongsfjorden, northern Svalbard (~79°N). Jónasdóttir (1999) found that the lipid dry mass fraction of C. finmarchicus at the start of overwintering in October within the Faroe-Shetland Channel (i.e., at 60°N) ranged between 40 and 64%. Johnson et al. (2008) reported similar lipid contents, 40–70%, in C. finmarchicus prior to overwintering in the northwestern North Atlantic in the lower Gulf of St. Lawrence at ~48°N. Hence, lipid accumulation in C. finmarchicus seems to be largely invariant within its habitat range of the western and eastern part of the North Atlantic and across a considerable latitudinal range from 48 to 79°N. This is in spite of the fact that the phytoplankton bloom dynamics varies considerable across these latitudes. Kristiansen et al. (2011), who studied the seasonal survival potential for larval cod at four selected spawning areas, found that seasonal feeding conditions for herbivores varied substantially across latitudes. At Georges Bank (~42°N) phytoplankton production occurs year around, although with a spring peak. In the North Sea (~54°N) the seasonal phytoplankton production is amplified compared to Georges Bank with a secondary autumn peak. At Iceland (~64°N) and Lofoten, northern Norway (~67°N) the seasonal cycle of the phytoplankton production is so large with complete lack of production during winter so that lipid accumulation and overwintering becomes mandatory for herbivore copepods like C. finmarchicus. Interestingly, lipid accumulation and overwintering of C. finmarchicus also occur in the southern part of the habitat as far south as the Gulf of Maine (~43°N) where, in principle, it could feed on the winter phytoplankton production (Runge et al., 2015). However, their regular seasonal life cycle known from the highest latitudes seems to become distorted and irregular limiting their overwintering to a shorter part of early winter. A key question arises from the above reasoning: What happens when temperate herbivore zooplankton species, like C. helgolandicus, encounter thermal conditions in which they can thrive at the high latitudes of the North Atlantic and where the winter dark prevents winter phytoplankton production? Are the required processes for herbivore organisms established at high latitudes with lipid accumulation during spring/summer, overwintering and fasting something that a lower-latitude marine organism just can turn on when climate change makes the high latitudes available for temperate species? The finding by Runge et al. (2015) cited above indicates that the opposite processes, namely turning off the lipid accumulation and the overwintering when high-latitude organisms migrate southwards of the latitude where winter feeding is possible, do not seem to occur. As observed by Dalpadado et al. (2012) there have been episodic presence of the temperate C. helgolandicus in coastal region at the southwestern entrance of the Barents Sea (~71°N) during the recent warm phase of AMO, but no established population. Broms (2015) reported that zooplankton species typically endemic in the North Sea have been observed in increasing abundances in the southern Norwegian Sea (i.e., south of ~64°N) over the recent decades. However, after 2011 these species have been less abundant. For example, the temperate copepod Mesocalanus tenuicornis that was observed frequently in the southern Norwegian Sea earlier in the recent warm phase was not present in 2014. Similarly, C. helgolandicus does not show any clear increasing trend in the southern Norwegian Sea. We hypothesize that the latitudinal change in bloom dynamics determined by the destined and stable latitudinal-dependent seasonal light cycle represents a fundamental barrier at high latitudes to the onward climate change-induced migration of temperate-adapted planktivorous from lower latitudes, unless they are able to adapt by depositing lipids and undertake overwintering. C. helgolandicus with its core production area to the south of the North Atlantic Current is a copepod species that is known to deposit only limited amounts of lipids and with no clear evidence of overwintering response (Wilson et al., 2015). There is no need since this temperate species can feed during winter, although less so than during spring/summer/autumn. We, therefore, conclude that it is not possible to extrapolate the present observed northward migration of temperate species beyond the latitude where spring-spawning species alone dominate the ecosystem, again implying that it would be impossible to maintain sustainable temperate species in the region to the north of about 63–68°N. We define this as the range of critical latitudes. 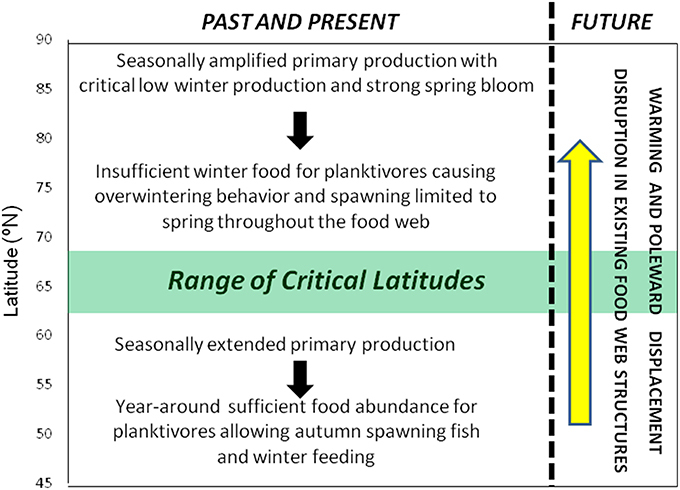 Poleward of the critical latitude planktivorous organisms must adapt by depositing lipids during the limited feeding season and overwintering behavior with reduction in energy consumption at depth during the winter dark when the energy demand for feeding activity and metabolism exceeds net energy uptake from the food. The exact latitude where this shift occurs is likely to vary between species, since the planktivorous food and feeding strategy of the various planktivorous predators differ. Hence, we define a latitudinal transition range as indicated in Figure 2. Figure 2. The attributes of the marine ecosystems north and south of the range of Critical Latitudes. North of critical latitudes planktivorous organisms need to develop a specific life cycle strategy to survive the lack of planktonic food during the winter dark. This implies building up lipid storage during the short feeding season during spring to summer and overwintering with reduced metabolism during autumn, winter and early spring to survive the dark season without sufficient plankton production. At higher trophic levels piscivorous organisms that can feed during winter dark are also influenced by overwintering planktivorous, since they have to limit their spawning to the spring time in order to provide planktonic food for their pelagic offspring. Wilson et al. (2015) reviewed the literature on the two congeneric calanoid copepods C. finmarchicus and C. helgolandicus. They concluded that there were surprisingly small differences between the two species. However, while there is a comprehensive amount of literature on the lipid deposition and overwintering dynamics of the arcto-boreal C. finmarchicus, the spares literature on the similar issues for the temperate C. helgolandicus indicates that lipid deposition is much less (Rey-Rassat et al., 2002) and too low for bringing the latest copepodite stages through the winter dark with a positive energy balance. Moreover, Wilson et al. (2015) found “no direct evidence that C. helgolandicus undergoes a period of diapause.” We do not know whether future life cycle adaptation (i.e., large lipid deposition and overwintering) would be possible for temperate species like C. helgolandicus. If so, such adaptation would need to take place within the present century when temperate climate conditions are expected to be reached in high-latitude regions like the Barents Sea under the business-as-usual emission scenarios (RCP 8.5). The next key question is whether the boreal lipid-accumulating and overwintering species, such as C. finmarchicus, would be able to adapt to the projected future higher temperatures in the boreal region in the central parts of the Nordic seas and in the Subarctic Gyre to the east of Newfoundland and south of Greenland. The present thermal habitat of C. finmarchicus is typically in the range between 0 and 12°C (Sundby, 2000; Hinder et al., 2014) and with the highest abundances between 2 and 6°C. In the Gulf of Maine, at the upper bound of thermal habitat, Preziosi and Runge (2014) found stable high hatching success of C. finmarchicus eggs up to 19°C but it dropped to less than 25% at 22°C. This is a surprisingly high thermal tolerance for a boreal copepod that is seldom found at temperatures beyond 14°C. It suggests that adaptations to higher temperatures could be possible for arcto-boreal species, although it is not clear whether the Gulf of Maine C. finmarchicus is a subpopulation of the species with genetic attributes different from that of the Norwegian Sea and Barents Sea. If temperate zooplankton species would not adapt to the high-latitude light cycle by developing lipid deposition and overwintering, nor that the boreal lipid-depositing zooplankton species adapt to the higher temperatures under future climate change, the high latitude northeast Atlantic region between the North Atlantic Current and the Arctic could become a region with low and decreasing ecosystem productivity. This is different from the present predominating scientific view (e.g., Cheung et al., 2011; Hoegh-Guldberg et al., 2014) that high-latitude marine ecosystems would become a region with increasing ecosystem and fish production under future climate change. The most prominent feature of change in marine species in the northern North Atlantic during the recent 40 years is their tendency for poleward migration. Poloczanska et al. (2013) synthesized marine ecological studies world-wide on longer-term (i.e., up to interdecadal) changes in phenology and distribution of species. Altogether, they considered 1735 reported marine biological responses. The major part of the study was from the Northeast Atlantic. However, very few were from the high latitudes to the north of 62°N. The global average propagation for the leading edge of marine species was 72 km per decade which is one order of magnitude larger than for terrestrial species. The variability in propagation between taxa and functional groups was large, however, with the main distinction between benthic species with low propagation speeds (~20 km per decade) and species confined to the free water masses with an average propagation speed one order of magnitude larger than benthic species. Among the taxa in free water masses, variability in speed was large but with no apparent pattern. For example, studies on phytoplankton showed a propagation speed of 470 km per decade, zooplankton 142 km per decade and bony fish 277 km per decade. It is, however, reasonable to expect that pelagic organisms should have much more dynamical distributions than demersal species that are generally constrained by shelf topography and even more for benthic species that can only change distribution during the early life pelagic stages. A major constraint for shifts in species distribution is their spawning location. If spawning areas remain unchanged, the area for juvenile settlement will also remain largely unchanged since the distance of free pelagic drift for the offspring are limited by the currents. Under such conditions, only changes/and or expansion in adult feeding migrations, which at high latitude typically occurs poleward, could displace populations as temperature increases. This implies that bottom spawning fish like capelin (Mallotus villosus) and herring with very specific demands for bottom substrates and current conditions have less potential for gradual changes in spawning areas than pelagic spawners. For example, Atlantic mackerel has wide spawning distribution west of the British Isles and in the North Sea. In the North Sea, spawning initiates at temperatures in the surface layers of 10–12°C (Jansen and Gislason, 2011). During the recent warming period from 1994 to 2013, mackerel in the Northeast Atlantic shifted its northernmost distribution from the Shetland-Western Norway region in 1994 (Uriarte and Lucio, 2001) to occupy the major parts of the Norwegian Sea northward to Spitsbergen and westwards in the northern Irminger Sea to the East Greenland Current (Nøttestad et al., 2013). The large migration of northeastern Atlantic mackerel over a 19-year period compares to a migration speed of nearly 1200 km per decade that exceeds by far any reporting up to the present as synthesized by Poloczanska et al. (2013). Such migration speed would probably only be possible by the two factors acting together: (1) the large feeding migration potential of the adult stock and (2) a displacement of the spawning areas into the Norwegian Sea as optimal spawning temperatures now also can be found in the southern Norwegian Sea. Another remarkable feature of the present advancement of the leading edge distribution of Atlantic mackerel in the northern Northeast Atlantic is that this northern fringe of the population is found at lower temperatures in the present warm phase than during the previous colder climate. The stock is now distributed during summer feeding westwards toward the edge of the East Greenland Current in the Irminger Sea and the Iceland Sea and northwards in the west coast fjords of Spitsbergen. This particular feature of populations migrating into colder temperature habitats as part of warming climate was pointed out by Landa et al. (2014) who studied the northeastward migration of Northeast Arctic haddock in the Barents Sea during the recent 30-year period from the 1980s. The average temperature of the ecosystem of the Barents Sea increased by about 0.8°C during this period while the haddock increased in abundance and occupied more of the northeast Barents Sea. However, the average ambient temperature of haddock decreased during the same period implying that the stock over-compensated for the temperature increase by advancing into colder waters. The authors suggested that this could be caused by the two factors (1) the increasing stock abundance would need to occupy a larger habitat, and (2) the increased temperature could have increased the plankton production that in turn would cascade to higher trophic levels generating improved food conditions. A support for the latter factor is that Beaugrand et al. (2009) also found that the average speed of shifts in distributions for calanoid copepods in the Northeast Atlantic during the period 1958–2005 was somewhat higher than the northwards movement of the isotherms of SST. Different from the distributional shifts of actively migrating fish stocks, the displacement speeds of zooplankton species are constrained by the speed of the ocean currents. On the other hand, they seem to be less constrained than fish in shifts of spawning areas. The shifts in spawning areas seem to be limited by the shifts in optimal ambient conditions for zooplankton spawning and of the generation time for the zooplankton. The distribution shift speed of calanoid copepods in the Northeast Atlantic during the second half of the twentieth century was on the average 231 km per decade (Beaugrand et al., 2009), and hence, quite large compared to many fish species. Finally, it should be emphasized that the speed of shifts in distribution, independent of taxa and functional groups, are very different in the Northeast Atlantic and in the Northwest Atlantic. This is because of the spatial structure in ocean climate (as well as in the terrestrial climate) in the northern North Atlantic region. In the Northwest Atlantic the frontal system between the Arctic and the temperate regions are much more compressed and geographically locked. From Georges Bank to Newfoundland the annual mean SST shift from about 15–5°C over a distance of about 1600 km. In the Northeast Atlantic a similar change in temperature is from the Bay of Biscay to southern Spitsbergen, a distance of 3700 km. Over geological time scales it has been shown for shifts between ice ages that the thermal structure in the Northwest Atlantic have largely remained unchanged while large thermal shifts have occurred in the Northeast Atlantic (Zahn, 1992). The North Atlantic spring-bloom ecosystem has its specific structure and functioning differently from other marine ecosystems of the world's oceans. In addition, the anthropogenic change in temperature, as well as the modes of natural temperature variability, is larger than in other ocean regions. The region contains the most comprehensive biological and hydrographic time series of the world oceans, some of them extending back to the beginning of the twentieth century. This implies that it is possible to distinguish between twentieth century anthropogenic temperature change and multidecadal climate signals like the AMO. Marine species of the Northeast Atlantic has been subjected to the largest poleward displacements in the world oceans in response to the change in temperature because of the latitudinal asymmetric shape of the Arctic front. This can explain differences in displacement speeds depending on functional groups. Benthic species display the lowest displacement speeds, while pelagic species with a large feeding migration potential seems to have the largest displacement speeds, particularly those species that more easily shift their spawning areas as well. A remarkable feature in displacement speeds is that many species over the recent decades of warming, from zooplankton species to pelagic and demersal species, have shifted poleward more than the shift in the thermal structure. This implies that the leading edge of the species is found at colder ambient temperatures during the present warm phase of the ecosystems than during the cold phase 40 years ago, possibly linked to the fact that these species also have increased in biomass and consequently would need larger habitats. Finally, we hypothesize that there is a limit to the poleward migration of species under future climate change. This is linked to the extreme seasonal light cycle at high latitudes with midnight sun during summer and day dark during winter that strongly influence the seasonal cycle of phytoplankton production. In response to this particular primary production cycle the present boreal planktivorous species at high latitudes deposit lipids during the short spring bloom and overwinter at depth during winter dark when phytoplankton production is insufficient for feeding. Unless invading temperate species from south are able to adapt by developing similar life cycle future poleward migration of such species will not be possible. SS was responsible formulating and developing the hypothesis and for synthesizing the major part of the literature. KD contributed to the synthesis of the literature. OK contributed on the further development the hypothesis and to the revisions of the paper. Boyd, P. W., Sundby, S., and Pörtner, H.-O. (2014). “Cross-chapter box on net primary production in the ocean,” in Climate Change 2014: Impacts, Adaptation, and Vulnerability. Part A: Global and Sectoral Aspects. Contribution of Working Group II to the Fifth Assessment Report of the Intergovernmental Panel on Climate Change, eds C. B. Field, V. R. Barros, D. J. Dokken, K. J. Mach, M. D. Mastrandrea, T. E. Bilir, M. Chatterjee, K. L. Ebi, Y. O. Estrada, R. C. Genova, B. Girma, E. S. Kissel, A. N. Levy, S. MacCracken, P. R. Mastrandrea, and L. L. White (Cambridge, UK; New York, NY: Cambridge University Press), 133–136. Broms, C. (2015). Dyreplankton i Norskehavet [Zooplankton in the Norwegian Sea] Havforskningsrapporten 2015. Fisken og Havet 1, 100–102. In Norwegian. Collins, M., Knutti, R., Arblaster, J., Dufresne, J.-L., Fichefet, T., Friedlingstein, P., et al. (2013). “Long-term climate change: projections, commitments and irreversibility, in Climate Change 2013: The Physical Science Basis. Contribution of Working Group I to the Fifth Assessment Report of the Intergovernmental Panel on Climate Change, eds T. F. Stocker, D. Qin, G.-K. Plattner, M. Tignor, S. K. Allen, J. Boschung, A. Nauels, Y. Xia, V. Bex, and P. M. Midgley (Cambridge, UK; New York, NY: Cambridge University Press), 1029–1136. Cushing, D. H. (1957). The number of pilchards in the Channel. Fish. Investig. Ser. II XXI, 1–27. Cushing, D. H. (1982). Climate and Fisheries. London: Academic Press. Drinkwater, K. F., Belgrano, A., Borja, A., Conversi, A., Edwards, M., Greene, C. H., et al. (2003). “The response of marine ecosystems to climate variability associated with the North Atlantic Oscillation,” in The North Atlantic Oscillation: Climatic Significance and Environmental Impact, Geophysical Monograph, Vol. 134, eds J. Hurrell, Y. Kushnir, G. Ottersen, and M. Visbeck, (Washington, DC: American Geophysical Union), 211–234. Ellertsen, B., Fossum, P., Solemdal, P., and Sundby, S. (1989). Relations between temperature and survival of eggs and first feeding larvae of the North-East Arctic cod (Gadus morhua L.). Rapports Procès Verbeaux Réunion Conseil Int. l'Explor. 191, 209–219. Fox, C., Harris, R., Sundby, S., Achterberg, E.:, Allen, J. I., Allen, I., et al. (2009). Transregional linkages in the northeastern Atlantic – an end-to-end analysis of pelagic ecosystems. Oceanogr. Mar. Biol. Annu. Rev. 47, 1–76. Hjort, J. (1914). Fluctuations in the great fisheries of northern Europe viewed in the light of biological research. Rapports Procès Verbeaux Réunion Conseil Int. l'Explor. 20, 1–228. Hoegh-Guldberg, O., Cai, R., Poloczanska, E. S., Brewer, P. G., Sundby, S., Hilmi, K., et al. (2014). “The Ocean,” in Climate Change 2014: Impacts, Adaptation, and Vulnerability. Part B: Regional Aspects. Contribution of Working Group II to the Fifth Assessment Report of the Intergovernmental Panel on Climate Change, eds V. R. Barros, C. B. Field, D. J. Dokken, M. D. Mastrandrea, K. J. Mach, T. E. Bilir, M. Chatterjee, K. L. Ebi, Y. O. Estrada, R. C. Genova, B. Girma, E. S. Kissel, A. N. Levy, S. MacCracken, P. R. Mastrandrea, and L. L. White (Cambridge, UK; New York, NY: Cambridge University Press), 1655–1731. Holst, J. C., Røttingen, I., and Melle, W. (2004). “The herring,” in The Norwegian Sea Ecosystem, eds H. R. Skjoldal, R. Sætre, A. Færnö, O. A. Misund, and I. Røttingen (Trondheim: Tapir Academic Press), 137–202. Hurrell, J. W., Kushnir, Y., Ottersen, G., and Visbeck, M. (eds.). (2003). The North Atlantic Oscillation. Climate Significance and Environmental Impact. Washington, DC: American Geophysical Union. Geophysical Monograph 134. IPCC (2013). “Climate change 2013: the physical science basis,” in Contribution of Working Group 1 to the Fifth Assessment Report of the Intergovernmental Panel on Climate Change, eds T. F. Stocker, D. Qin, G.-K. Plattner, M. Tignor, S. K. Allen, J. Boschung, A. Nauels, Y. Xia, V. Bex, and P. M. Midgley (Cambridge, UK; New York, NY: Cambridge University Press), 1535. Maynou, F. (2011). “Impact of NAO on Mediterranean fisheries,” in Hydrological, Socioeconomic and Ecological Impacts of the North Atlantic Oscillation in the Mediterranean Region, Advances in Global Change Research, Vol. 46, eds S. M. Vicente-Serrano, and R. M. Trigo, (Dordrecht; Heidelberg; London; New York, NY: Springer), 236. Melle, W., Ellertsen, B., and Skjoldal, H. R. (2004). “Zooplankton: the link to higher trophic levels,” in The Norwegian Sea Ecosystem, eds H. R. Skjoldal, R. Sætre, A. Færnö, O. A., Misund, and I. Røttingen (Trondheimp: Tapir Academic Press), 203–226. Nakken, O. (1994). “Causes of trends and fluctuations in the Arcto-Norwegian cod stock,” in ICES Marine Science Symposia, Vol. 198 (Copenhagen), 212–228. Nøttestad, L., Utne, K. R., Anthonypillai, V., Tangen, O., Valdemarsen, J. W., Oskarsson, S., et al. (2013). Cruise Report from the Coordinated Ecosystem Survey (IESSMS) with M/V “Libas,” M/V “Eros,” M/V “Finnur Fríği” and R/V “Arni Fridriksson” in the Norwegian Sea and Surrounding Waters, 2 July - 9 August 2013.Working Document to ICES Working Group on Widely Distributed Stocks (WGWIDE), 27 August - 2 September 2013, International Council for the Exploration of the Sea (ICES) Headquarters, Copenhagen, p. 42. Rhein, M., Rintoul, S. R., Aoki, S., Campos, E., Chambers, D., Feely, R. A., et al. (2013). “Observations: ocean,” in Climate Change 2013: The Physical Science Basis. Contribution of Working Group I to the Fifth Assessment Report of the Intergovernmental Panel on Climate Change, eds T. F. Stocker, D. Qin, G.-K. Plattner, M. Tignor, S. K. Allen, J. Boschung, A. Nauels, Y. Xia, V. Bex, and P. M. Midgley (Cambridge; New York: Cambridge University Press), 225–315. Rollefsen, G., and Vedel Tåning, Å. (eds.). (1949). Climatic changes in the Arctic in relation to plants and animals. Rapports Procès Verbeaux Réunion Conseil Int. l'Explor. 125, 1–52. Trigo, R. M. (2011). “The impacts of the NAO on hydrological resources of the Western Mediterranean,” in Hydrological, Socioeconomic and Ecological Impacts of the North Atlantic Oscillation in the Mediterranean Region, Advances in Global Change Research 46, eds S. M. Vicente-Serrano and R. M. Trigo (Dordrecht; Heidelberg; London; New York: Springer), 236. Vicente-Serrano, S. M., and Trigo, R. M. (eds.). (2011). “Hydrological, socioeconomic and ecological impacts of the North Atlantic oscillation in the mediterranean region,” in Advances in Global Change Research 46 (Dordrecht; Heidelberg; London; New York: Springer), 236. Copyright © 2016 Sundby, Drinkwater and Kjesbu. This is an open-access article distributed under the terms of the Creative Commons Attribution License (CC BY). The use, distribution or reproduction in other forums is permitted, provided the original author(s) or licensor are credited and that the original publication in this journal is cited, in accordance with accepted academic practice. No use, distribution or reproduction is permitted which does not comply with these terms.